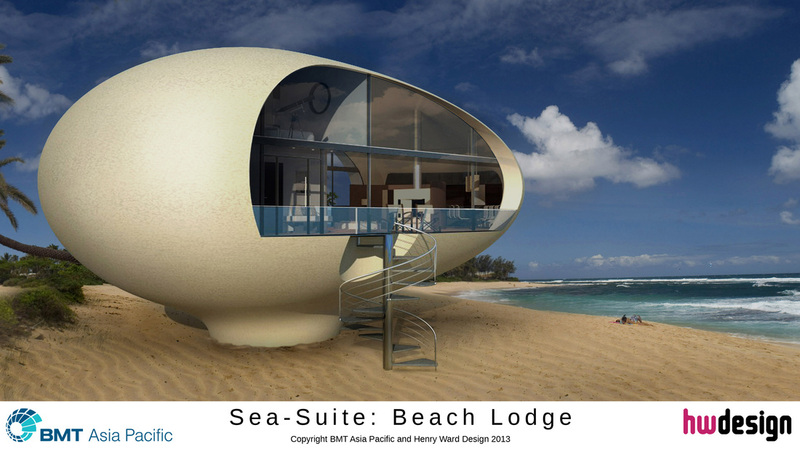 BMT Asia Pacific (BMT), a subsidiary of BMT Group, announce the development of a new series of houseboats, floating lodges and beach houses, crafted from a unique egg-shaped form reclaimed from a previous project. Featuring clean lines and smooth, organic curves, this modern and elegant structure was originally developed as a composite radome for the new landmark cruise liner terminal in Hong Kong. "The large-scale form fabricated to fulfil this contract represented a significant investment in its design,development and use of material.” said Richard Colwill, Managing Director of BMT Asia Pacific who, as project leader of the radome delivery, believed the compelling shape had the opportunity for a second life. After reviewing opportunities for use of the mould’s two “half shells” which formed the egg, a series of options from swimming pools to temporary stages were examined. However, staying true to BMT’s maritime pedigree the first offerings are to be waterborne and coastal structures. Designed by Richard Colwill and Henry Ward of Henry Ward Design, the first models of in the ‘Sea-Suite’ series illustrate the flexibility of the form. In the same way that an egg provides a flexible base for many recipes, we see countless opportunities in the development of this design for private or commercial use. The familiar, yet innovate form could be readily deployed along river and coastal sites, and a beach house variant has even been developed. We look forward to working with individuals and companies on the deployment of our firsts units, and are sure that the variety of applications ultimately created will significantly expand upon our preliminary designs.